Hello folks! Jerm here with another update for you on some good foodie spots! 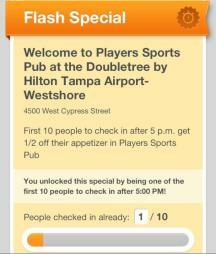 I stopped by the DoubleTree Tampa Airport Westshore the other day to grab a bite to eat at Player&apos;s Sport&apos;s Pub! This place isn&apos;t just your typical bar food guys, as the award-winning menu includes your favorites and more, like Delicious, 100% Certified Black Angus burgers are served on Costanza rolls imported from New York, prime rib sliders and so many other menu options! The Starting Lineup includes a huge selection of appetizers, including smothered nachos, jumbo wings and an amazing 3 cheese spinach artichoke dip. I decided to pop in for a quick bite to eat and had the amazing Mango BBQ chicken wings and they were almost too pretty to eat! Don&apos;t believe me, then take a look at the photo to your right! 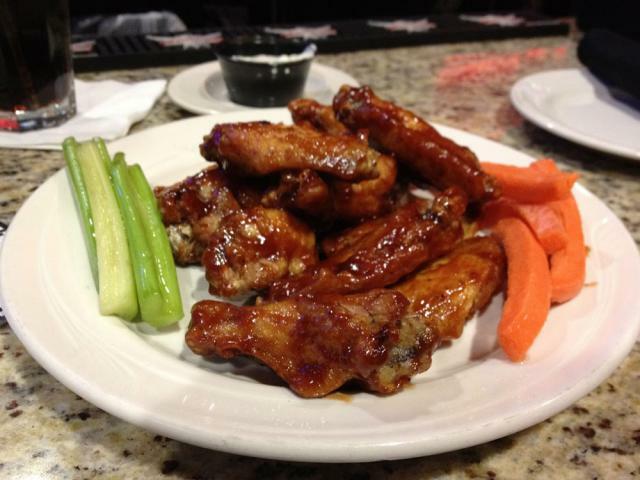 What makes the wings and all of the other menu items so awesome is that checking in on Foursquare at Player&apos;s will get you some sweet appetizer and other menu specials! When I checked in, I got half off of my appetizer! Best thing about the specials is that they change often so you are always getting an awesome deal! In addition to the wings, I got some Kobe Beef sliders and fries to go, and boy were those bad boys good! I would have taken a photo, but I ate them before I could snap the pic! Oh well, I&apos;ll for sure be back again and I promise to take a pic before I get the ol grub on! If you are looking for drinks, then look no more as the bartenders at Players Sports Pub have got you covered with a full liquor bar, great selection of wines and signature draft beers. Looking for a mojito? Look no further as you can choose From the finest mixed berry mojitos! Players offers a unique, double bar design with hard wood floors, 14 HDTV&apos;s, a 120" projection television and a superb sound system. They subscribe to all major sports packages and televise special events. All in all folks you can&apos;t go wrong here. Its also a great place to watch all the games this bowl season including the upcoming Outback Bowl, if you won&apos;t be making it to Raymond James Stadium! That&apos;s it for now, but stay tuned in for more updates on Tampa Bay dining and things to do in Tampa Bay!